This is a lifesize seedy motel room. Shown in the exhibit Dulces, it references the large hotel sculpture "Big El Mirador." The room, with dirty dark walls and old silk curtains, has a cross and cheap religious art on the walls, a bottle of tequila, and a bible. The phone rings and when answered, one can hear mysterious conversations and a man preaching in Spanish. A video of the El Mirador plays on the old tv, and a shower can be heard through the bathroom door. 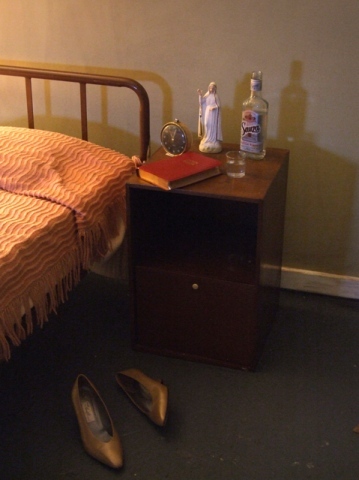 Hints of the woman who stayed there are left behind--her shoes near the bed and an open suitcase.